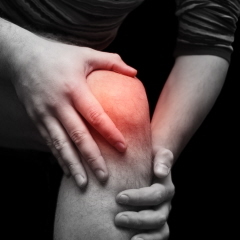 Many Conditions Can Cause Knee Pain. The knees take a pounding. With every step, pressure is exerted on these vital joints. Athletes and the elderly are particularly vulnerable to knee injuries and degenerative joint disease. In the 2006 National Health Interview Survey, 18 percent of respondents said they experienced knee pain. For some, the discomfort is a minor irritation that flares up once in a while. Others endure extreme pain, and struggle to carry out everyday activities. Knee conditions sometimes lead to disability. The knee pain may emanate from various parts of the joint, and from surrounding ligaments, tendons and bursa. The three bones that join to form the knee joint are the thigh bone (femur), shin bone (tibia) and kneecap (patella). Four ligaments hold the bones together and maintain stability in the knee. The medial and lateral collateral ligaments permit sideways movements. Two cruciate ligaments (on the inside of the knee), the anterior cruciate ligament (in front) and the posterior cruciate ligament (in back) are enable the joint to move forward and backward. Knee pain can result from ACL and PCL sprains and tears, knee arthritis, pes bursitis, anterior cruciate ligament damage, shin splints, tendonitis, cartilage lesions, meniscus tears, MCL tears and other conditions. Injuries caused by blows to the knees, falls and accidents feature instant, severe pain. The RICE formula (rest, ice, compression and elevation) is often an effective treatment for knee pain. Doctors advise patients dealing with degenerative conditions to lose weight, and exercise the muscles around their knees. Nonsteroidal anti-inflammatory drugs relieve pain and swelling. Those who fail to find relief through physical therapy and rehabilitation have several surgical procedures to consider. Orthopedic surgeons frequently can correct problems with arthroscopy, the insertion of tiny instruments through small incisions to remove or repair tissues. Cartilage and other graft material to replace damaged tissues is taken from the patellar tendon (between the kneecap and shin bone), and from the hamstring and quadriceps tendons. To treat knee osteoarthritis, surgical methods are osteotomy, the cutting and reshaping of the shin bone or thigh bone to relieve pressure on the joint; and arthroplasty, the total or partial replacement of the knee with metal or plastic materials. Some patients suffering from knee pain have benefited from injections of platelet-rich plasma. Among them are those diagnosed with quadriceps tendonitis, a condition that sometimes requires reattaching the tendon to the kneecap. Pes bursitis is characterized by inflammation of the bursae between the shin bone and the hamstring muscle tendons. A surgeon might have to remove the bursae. In the case of shin splints, when a muscle has been torn away from the shin bone, surgery is necessary to reattach the muscle. The San Diego Orthopedic Surgeon Center offers minimally invasive procedures to treat knee symptoms caused by injury or disease. Dr. Robert Afra provides arthroscopic cartilage repair and ACL reconstruction, resurfacing techniques, partial knee replacement and total knee replacement. Knee surgery specialists at the center help patients understand their alternatives, and work with them through every stage of the process.